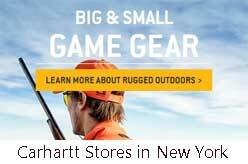 Address of all Carhartt Stores in New York. Established in Detroit in 1889, Carhartt manufactures premium clothing for the active worker. Headquartered in Dearborn, Michigan and U.S. facilities are located in Kentucky and Tennessee. Company-owned retail locations throughout the U.S. and flagship store is located in Midtown, Detroit. Men’s – Outerwear, Shirts, Pants & Shorts, Hoodies & Sweatshirts, Bibs & Coveralls, Accessories, Thermals and Underwear, Footwear, High-Visibility, Scrubs, Full Swing. Women’s – Outerwear, Pants & Shorts, Hoodies & Sweatshirts, Tops & Shirts, Accessories, Thermals, Footwear, Scrubs, Winter Essentials. Kids’ Realtree® Gear, Infant, Toddler, Child 4-6X, Youth 7-16.